B2G stod for Boot to Gecko, a name implying that you would boot into Gecko, the rendering engine of Firefox, and a codename that stuck around for about a year. Apparently it was about building a mobile operating system based on, and targeted at, the Open Web. The wiki page took most of us by surprise, including our Press and Evangelism team, since it got some traction in press before we got briefed about what it actually was. We scurried around and had meetings to come to a conclusion to what it actually was. Almost two years ago I wrote my first article for the Mozilla Hacks blog about it: Announcing Boot to Gecko (B2G) – Booting to the Web. Over time, the project developed and a lot of things were ironed out, in establishing what the main focus would be, what the core undertaking encompassed and how to move forward. The idea with Firefox OS is to develop a mobile platform that is completely open, and which gives a lot more possibilities to developers, partners and, ultimately, consumers. As I’ve stated many times, the idea is not to compete with iPhones and high-end Android phones, but rather to offer an alternative to emerging markets. How can people who have no phones, or old feature phones, get access to a smartphone for a really low cost? How can we continue to ensure that the Internet is as democratic as it can be, that as many as possible can take part and contribute without having to pay many hundreds of US dollars to just get in through the front door? There’s an estimate of two billion (!) more people coming online in the next few years, and a vast majority of them will do it through mobile. How can we help them, give them affordable options? We at Mozilla believe we can do that through a completely open device, enabling everyone to contribute to it, afford it and also inspire and influence other players in the mobile field to make their devices more open, more powerful when it comes to the Open Web and priced at a realistic level. From day one, the repository was available on GitHub. Day one. Everything that has been developed since then has been real-time, and possible for anyone to see, analyze and contribute to. The project first lived in a person’s own repository, but was then moved into a Mozilla one. My own belief – and I’ve stated this many times – is that where I personally think Apple took the wrong path was with how to build things for the iPhone. With the first version they said that all should be the web and you could access it through the mobile Safari web browser. The problem was, of course, that no web site could access anything on the device, like contacts, camera etc. Basically, while the iPhone was a massive leap forward for mobile phones, developers were less than excited with the lack of possibilities for them to build things. Then Apple went down the path with Objective-C, The App Store and the rest is history. I much more wish that they had chosen to make the web part much stronger, give it access to local device APIs and evolve into the powerful platform it deserves to be. But alas, that didn’t happen, and they went with their own closed and proprietary approach. So, someone else had to make it happen. In August of 2011, I wrote the first blog post about our WebAPIs iniative at Mozilla, which targeted just that need of improving access for the web layer. Since then I’ve written a number of articles about various APIs and our dedication to standardize these – because if we only did it for us, we wouldn’t do the best for the Open Web. My most extensive post on APIs was Using WebAPIs to make the web layer more capable, which I believe is a good introduction to just how many things you can do from the web layer. Apps – what are they and do we need them? With Apple’s move with the App Store, everyone wanted to create their own store, where they had complete control, their own APIs and with the goal of making a lot of money. Which is fair, they are businesses and they protect their interests. Personally, I believe the web and just using URLs to get something is the most powerful thing we have, and something we should cherish and protect for the future. And then if you need a shortcut (bookmarks, anyone?) 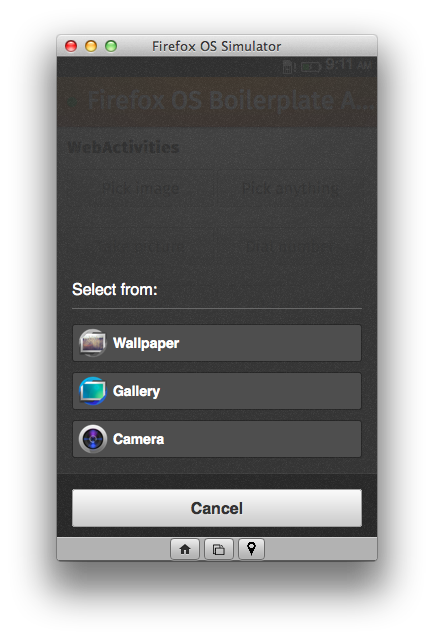 you can add a web page/URL to your home screen and that’s it. Users will gain from this and developers will need to build with one technology – the web – instead of having a separate team for each mobile platform. With Firefox OS, the goal has not been to have developers learn something from scratch, but rather utilize and reuse heir existing Open Web technologies. Since user’s have gotten so used to apps, we are offering that possibility in Firefox OS as well, but have made sure that it’s based on the Open Web (I’ve written more in detail about this in Getting started with Open Web Apps – why and how). We also have a Firefox Marketplace where you can submit your apps, for findability, payments and more. What’s crucial to know here, though is that you don’t have to build an app if you don’t want to, you don’t have to use the Marketplace – apps are installable from anywhere. Over time, we hope that other people can create their own dedicated Marketplaces as well, for certain topics or local interests. You could just as well continue to build your own mobile HTML5 web site – with Responsive Design, of course – and you will be good to go on Firefox OS. I see apps an optional approach, not the one and only. The choice is yours. Also, for users, if you swipe to the left from the home screen in Firefox OS, you will get to the integrated Everything.me service – finding mobile web sites out there that you can test first, and then pin to your home screen if you want to. With above mentioned WebAPIs, there are some things on a mobile that are to sensitive to expose and give complete access to, like telephony or SMS. But, naturally there are use cases where you’d want to trigger and interact with them from your content or app. Therefore, we introduced Web Activities, which gives you a simple and powerful way to do just that, and with a connected user experience and approval. It has also been interesting to see how tools and options have developed, to test this open platform in a simple and lightweight manner. I’m tremendously grateful for the work by Myk Melez and others on the Firefox OS Simulator, and I’ve happy to have been able to help developers by creating the Firefox OS Boilerplate App – all based on developers’ needs and input. When it really got exciting, and things started to take off, was about six months after the initial announcement. It was time for the massive Mobile World Conference in Barcelona, the place to be at if you were doing something in the mobile sector. I watched it from afar, and tried to assist the announcements and attention with writing about it in Mozilla’s Boot to Gecko – The Web is the Platform and Gaia, Mozilla’s user interface for Boot to Gecko – all web technologies. It gained an enormous interest and from then, it has been busy days. 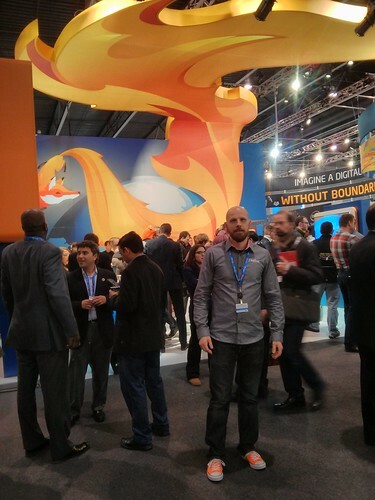 This year I decided to go to Mobile World Congress, I had to be a part of what was going on. And it was such a wonderful and extremely intense experience! Working from early morning till late nights, talking, learning, sharing. It was wonderful to see all the interest and hope around Firefox OS, something that I believe must be somewhat akin to the 1.0 release of Firefox. How can we create something open and make a difference? Yesterday we announced that the first Firefox OS devices are coming into the market, and today the very first devices will be available for sale in Madrid, Spain. There are a number of other countries and places to be announced in the very near future, and with a lot of hardware and operator partners, this is so exciting! There has been so much hard work by so many people going into this: to make it work, to get through the hard times, to seal the the deals, to understand, educate and inspire developers. A lot of effort has gone into this, but for me, I don’t regret one second. And thank you to eveyone for all your contributions to this project! I was there day one. I was along for the entire ride, from the first code commit to seeing the actual devices being launched, to people owning them. It has been a magic experience, and frankly, I’m a bit touched. Within one’s career, I don’t believe many get the chances to be there from the initial spark to the the launch of a completely new mobile operating system. And this is not the end. It has just begun. It must have been absolutely great to be there from day one on this project. I hope Firefox OS can live up to all it’s expectations. It certainly has a base of people committed to it, now time to take over the world! I’ve been searching for this bird’s eye overview of Firefox OS past-present-future since it caught my eye, so, thank you. Thanks! And yes, it’s been very interesting times! I’ve been following the project since you were in South America with other Mozillians last year. It’s been quite a ride, it was hard to believe when I had the chance to see a couple of dev phones in real life running Firefox OS. As you said, this has just begun! Happy that you want to be a part of and contributing to the Open Web! Great words Robert – It must be a pleasure being part of this team, building amazing this aiming to change the world! Thank you! And it’s an exciting ride, for sure! It should all be in the same repo, and developed in the open. Same goes for Gaia, the UI of Firefox OS. Please, please don’t limit this to low end devices (I realise you won’t stop anyone from putting it on high end devices, but people won’t (or not as much) unless you recommend it). p.s. I work developing apps that run in PhoneGap and mobile browsers, and I look forward to developing Firefox OS apps once the demand is there. The initial plan is to launch Firefox OS in emerging markets. Over time – and based on how it pans out, of course – I’m sure we will see a number of different tiers of devices, performance and costs. So rather see this as an initial step, and I share your hope that the web will be the platform for all devices. For open development to really succeed we first need to lose the term “users”, and go to something like “crusers” for creative users. The web is radically different from any broadcast technology. It is not just about providing information to people, it is about people sharing information, ideas, creativity and even physical objects (re: for example 3D printers via services like thingiverse). We are on the cusp of a new union of freedom, creativity, recognition and global productivity that the world has no equivalent concept. Knowledge is more available now in one second than ever existed up to that second. The internet makes that possible. As I typed this, billions of people had new thoughts, new access to information and greater ability to interact with others who also had similar thoughts and ideas. There is a synergism there that is not easily modeled nor controlled. I have worked hard to develop coding skills and also tried to share my knowledge with others. If each of us teaches 8 others three times a year, our knowledge blooms at an exponential rate. If we share that via the web, it grows even faster. There will be bad actors, there will be humanitarians, and there will be explorers, hermits and others all utilizing or ignoring these abilities. There will be some threatening, some helpful, but all contributing in their own ways. The key is those who absorb, assimilate, innovate and share will be the new founding fathers. A recognition of one of our internet and weblink founders, who helped found Silicon Valley. I don’t know about firefox as an OS, I will check it out, but I think the cloud is less than most of the hype gives it. Moreover, as businesses consolidate, the power of the cloud will tend to condense, and the ability of a few players to censure, control and alter the information and its dissimination is less than desirable. But having many repositories, and distributed copies of all information is one way to ensure our successors will have freedom and access. Is this basically an OS for web only applications? If so, how its it any different from a browser with extensions? What’s exactly the OS part? I hope you have planed it to have a non Internet mode. If not, when the Internet is down or lousy, the device will be a useless brick. This seems obvious, but you would be surprise how many companies believe that people are connected 24/7 with high speed Internet everywhere they go. BTW: Bonus points if you get a non Internet mode that can still work on a network without the Internet. Many business applications do not really need (nor it is wise) to be in the Internet, but might be on an Intranet. Having the device connected to the Internet is a liability (sometimes legal, as in the case of medical and legal professions) on this situation. Congrats to you and your team at Mozillla! These are exciting times indeed, and I’m really hoping FirefoxOS can grab a decent market share! I hope more will be available soon. For me, the definition of users aren’t only taking, but contributing as well. And I agree, we need to share knowledge with each other. When it comes to Firefox OS and the cloud, though, there’s no connection. The OS runs directly on your phone, just like iOS, Android etc. I was hoping the explanation in this article and the ones I’ve linked to would help to explain that. The entire operating system itself is also built with web technologies, having access to a number of WebAPIs such as telephony, texting etc, giving the web layer full access to the hardware. Offline, as most people refer to it, can be done through AppCache in HTML5 or with Packaged apps. The OS itself, of course, doesn’t need any connection to run. And you would be able to connect it to any WiFi network – if you have one that’s only internal, it will work just as fine. I’m sure Firefox OS will be very popular in the emerging markets. For that the price has to be attractive, though. People tend to think about how many apps are available for a particular phone/platform when they make a choice in smartphone/tablet. Low-end Android phones, despite their not-so-satisfactory performance, win the hearts just because of “millions of apps” despite the fact that not all of them work nice. The link is http://www.moz-mag.com . We call it The Mozilla Magazine. And sure, people compare number of apps, but with initiatives like Everything.me baked into Firefox OS it will make it easier to find mobile web sites that will work right out of the box on a Firefox OS phone, and then, if you want to, you can install it as an app. And thanks for Mozilla Magazine! I read the condensed version of the chat with Mitchell Baker there, much appreciated! Thanks for your response, Robert! I totally see the potential future of Firefox OS specially because the next generation is HTML5. But I guess for usefulness’ sake, the apps have to work offline. I ha a chance to take a look at Keon and most of the apps, that don’t really need an Internet connection, did not run because of not having an active connection. But I’m hopeful, since Mitchell Baker said apps will work offline that don’t need an internet connection (like Facebook, that does need connection). Definitely, but beyond the preinstalled apps on Firefox OS, offline availability is up to the author of the app: they can do it with offline/Appcache support in HTML5 or they can do a packaged app. I’ve written extensively about apps and options in Getting started with Open Web Apps – why and how.